One of the many drawbacks of the government shutdown is that couples with weddings scheduled at national parks and monuments now have to find new places to get hitched. Mike and MaiLien were one of these unfortunate couples, having planned their October wedding at the Jefferson Memorial, which also happens to be the site of their first date. The pair then did what any couple would do. 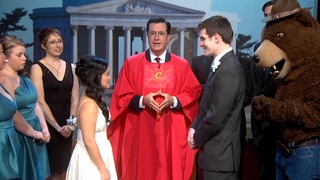 They went on The Colbert Report, got blessed by Mandy Patinkin, married by Stephen and serenaded by five-time Tony winner Audra McDonald. Desperate times call for desperate measures, I suppose. It's just so sad that their wedding couldn't be more memorable.